Off to Camp or on a weekend residential away? Offering a residential experience is so important, something which provides opportunities that other parts of the programme just cannot! Sometimes with the busyness in our Companies, we lose sight of something which is so important - building relationships with the children and young people. Residentials can provide that opportunity for us as leaders to really get to know the children and young people whilst also helping the individual and the group as a whole in a range of ways. Top Tip: It’s important to think about what you want to get out of running a residential; do you currently do this when you plan your residentials? Taking children and young people away from home overnight, particularly camping, has always been an important part of growing up in the BB. The BB first started camping in 1886 and since then residential experiences have played an important part in our programmes. Often our memories and those of the children and young people in our Companies will be of residential experiences, that “week in Dyffryn”, or “weekend away in France”. 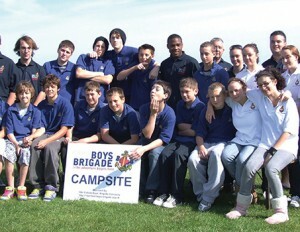 The survey of children and young people carried out by the Brigade during the Programme Review (2004) showed that camps and residential trips were the highlight for many. How important are residentials in your Company? What do you offer each year? Do you have a residential opportunity on offer to every child/young person (as eligible)? Have you considered progression? What does a young person who is 11 have to look forward to when they are 16? Residentials can often be the key to retention, especially with older members. There are so many ways of going about running a residential experience, with different types of venues and environments. These could include, but are not limited to, a sleepover at your meeting place, going to a residential activity centre, youth hostelling, going to a festival or event, using a church hall, an expedition; narrow boating, camping or even going abroad. Are there reasons why we can’t offer residentials? The main barrier cited is often the lack of available leaders. Other reasons can be lack of experience, associated costs, lack of transport or local resources. How can we break down these barriers? You need at least two leaders to be able to run a residential of any type, and someone has to take responsibility for it. But, you can perhaps lighten the load. In BB terms the person taking overall responsibility would be a registered leader (an Officer) who has the Holiday Leadership Certificate (a 1 day course being run throughout the Brigade, see boys-brigade.org.uk/training-database.htm for a list of courses). The Holiday Leadership course will be of great help in providing the opportunity to think through what you will need to do and give you some ideas on how to go about things (choice of location, risk assessments, etc). Alternatively it might be that you could organise a residential as a joint activity with another Company or group of Companies, or as a Battalion/District which might mean that someone else takes on the responsibility for leading the residential and/or may mean your Company only needs one leader to accompany your young people. Top Tip: Sometimes running a residential will mean leaders will need to take time off work; it’s worth talking to an employer, as some will be supportive and give additional time off, allow half days before or after, etc. It’s always going to be helpful to have learned from previous experiences. If you’ve never run or been on a residential with children/young people before, then why not see if you could go along to something being organised by another Company? If your Company runs residentials already, have you considered succession planning? Encouraging others to take responsibility can build up valuable experience across your team. A big factor for children and young people and their attendance will be around cost and value for money. But it’s also important to realise that cost can also be a barrier for some leaders. However the cost of BB holidays is often very reasonable compared to the costs for residentials by schools and other providers. The cost of our residentials can vary considerably, from using your own hall for a sleepover where food and other costs might mean £5 per person to organising a trip abroad which might cost £500+ per person. Top Tip: Don’t under-value the creativity of your own staff and equipment/resources, with what you can do on-site or in public places (parks, beaches, sightseeing) or at free attractions (museums, exhibitions, etc.). Putting together a budget and planning well in advance will help you to keep costs down and under control. Numbers will play a big factor and there will be some financial risk based on a minimum number of young people attending. Again forward planning and encouraging small deposits before you have to confirm bookings can help to reduce this risk. Some adventure and activity centres offer per person costs rather than hiring out a whole building and exclusive use of activities, and they sometimes offer free leader places. So the big message here is to do your research and plan the what, where and when based on it being affordable for your children and young people (and leaders!). Does your Company offer assistance to children/young people that would struggle to meet the cost? If not, could you offer support, by doing some fundraising or approaching your Church/Battalion for support? You could also consider putting in a funding application, your local authority may be able to offer grants. Naturally here we think of leaders driving cars and minibuses, which probably is the most common way, but not the only way. Some Companies will ask parents to drop children/young people off at the location (if a reasonable distance) and ask that parents help each other out and work together. Others will jump on a train, as children and young people can often travel cheaply by rail. Some residential activity centres will organise transport for you to take that hassle away. Importantly it’s about working within your means here, what options you have available to you and choosing your location based on those. You should speak to another leader, ask for some support from someone you know who already runs residential activities in their Company, or bring it up as a point for discussion at a Battalion meeting. Alternatively contact your Regional Headquarters who will be able to offer some support and advice and point you in the right direction.